Bill Gates Tells The World: Get Ready For The Next Epidemic : Goats and Soda In a strongly worded essay in The New England Journal of Medicine, the philanthropist calls for a global system to respond to future medical emergencies. We ask experienced Ebola hands to weigh in. 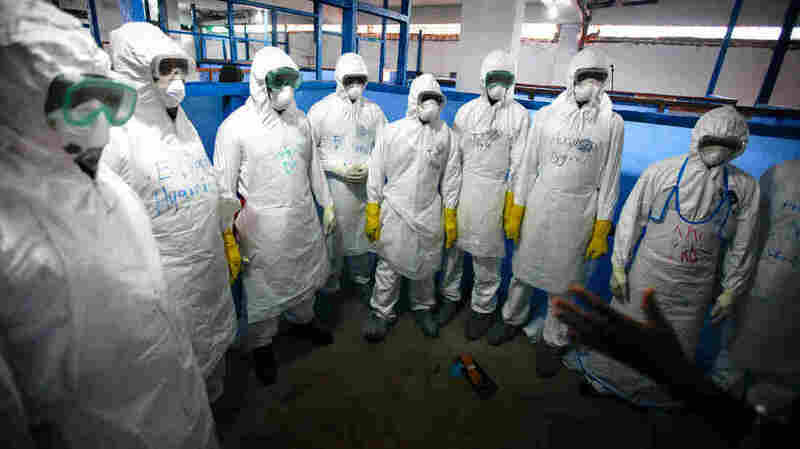 Health workers suit up for Ebola duty in Monrovia, Liberia. "An epidemic is one of the few catastrophes that could set the world back drastically in the next few decades," Bill Gates warns in an essay he wrote for the March 18 edition of The New England Journal of Medicine. In the article, titled "The Next Epidemic — Lessons From Ebola," he says the Ebola epidemic is a "wake-up call." "Because there was so little preparation, the world lost time ... trying to answer basic questions about containing Ebola," writes Gates (whose Bill & Melinda Gates Foundation is a supporter of NPR). That's why, he continues, "the world needs a global warning and response system for outbreaks." And part of that system must be a better way to get supplies and "trained personnel" to the scene, where they can work with local efforts. Few people would argue with that goal. But there's a lot of debate around how to execute his proposal. For example, some global health gurus aren't so sure we need to create a response system. Maybe we already have one. Look at the response to the 2013 typhoon in the Philippines, says Dr. Bruce Aylward, assistant director general for emergencies at the World Health Organization. "Within two weeks, we had 151 foreign medical teams on the ground." The response wasn't so fast when Ebola struck West Africa. Actually, many agencies agree with Gates that it was way too slow. And the question is why. It wasn't that there weren't enough volunteers, Aylward says. Rather, the volunteers needed to know what would happen if they were to contract Ebola. And there weren't reassuring answers early in the epidemic. "There was no way anyone could guarantee the right of medical evacuation for people affected by Ebola," he says. So for any future force of emergency health workers, it's critical to offer what Aylward calls "duty of care" — the ability to ensure the needs of aid workers can be met if anything were to happen, in terms of their health, security or safety. Then there are questions about whether flying in outsiders is the best solution. "I'm going to speak frankly," says Emmanuel d'Harcourt, senior health director of the International Rescue Committee. "While there's probably some value in the margin [of a global response system], it's not the heart of the issue, and it has the potential to distract us from the real issues." "Local preparedness and local response," d'Harcourt says. "We know that in most disasters, not just epidemics, but all kinds of disasters, the people who are able to respond the earliest are local. If you have local preparedness, you don't really get a major epidemic at all." A team on the ground has another advantage, he says: They know the terrain. After the Pakistan earthquake in 2005, the response from IRC didn't involve "flying people in from all over the world." A team in Pakistan that had been serving Afghan refugees for a couple decades was there in less than 24 hours, d'Harcourt says. They knew how to provide health care and basic needs, such as shelter "in a culturally appropriate way." And it's easier for disaster victims to trust their fellow countrymen. In the early months of the Ebola outbreak, the citizens of West Africa often believed that the virus was part of a conspiracy — that Western doctors were making patients sick. Those rumors made many people reluctant to seek treatment. To debunk that kind of thinking, d'Harcourt says, you need fellow citizens who can say, "I know you think it's a plot, but here's why I don't think it's a plot." D'Harcourt also believes that the idea of a rescue mission "infantilizes" people, treats them like children awaiting salvation. "You know, nobody, not even children, likes to be treated like children," he says. "I say this as a pediatrician. Children are always asking for more responsibility, more autonomy." A textbook example of how a person native to a country can help, he says, is the story of Alpha Tamba, a Liberian physician's assistant. During the Ebola crisis, Tamba went to villages in hard-hit Lofa County and said to the villagers, this is what I can do — "what can you do?" For example, he provided the chlorine and buckets for hand washing, but the villagers set up their own quarantines. When outsiders impose quarantines, d'Harcourt says, that doesn't always work out. Of course, outsiders can, as Gates writes, play a critical role in quashing any future outbreak. But they have to have the right mindset and even the right garb. If workers come in with white helmets, says Dr. Joanne Liu, international president of Doctors Without Borders, "it gives them a sort of a militarized label. In my organization, we do not feel comfortable with the idea that there are blurred lines of humanitarian aid and military action." She also stresses that any group of emergency workers must be prepared to follow orders from the agency they're working for. "You need people who are able to be disciplined, to follow the rules, so you would not put yourself in danger," she says. Volunteers must heed both medical and cultural instructions, she says. A volunteer who thinks he or she knows it all could end up creating problems. "You just cannot improvise and be the humanitarian Ebola tourist of the day," she says. So Gates' essay is doing what it should be doing: opening up a conversation. "Now that Gates has written his article," Liu says, "I need to write mine." One point she would make has to do with something as seemingly mundane as time away from work. Some medical workers in the U.S. were lined up and ready to go to West Africa, she recalls. But when it turned out they would miss not only a month of work when they were in the field, but another three weeks afterward for quarantine, "some of them just could not go."